The Inter-School Horse Show Series (ISHS) makes it super simple for students to get in the saddle. On this page, you'll find basic information about the series that will help you get started. Click here for more details about how our shows work and click here to contact us with questions. Ready to register? Click here to sign up. Click the pic to see the show and hear what people are saying. Our shows competitive-- but low stress and fun! We have classes for everyone from first time showers to A Circuit riders, and we always welcome new schools and students to sign up. You can bring your own horse or ride one of ours, and classes are judged on Equitation (meaning the judge looks at the rider and ignores the horse) so it's fair for everyone. We welcome you to ride on a school team or as an Independant Rider (which is our way of saying you ride solo-- like at a standard horse show), and can compete in as many (or as few) shows as you like. But points are accumulated throughout the year, so the more shows you enter the better chance you have at winning a year end award! Click the pic to watch the video, then send it to your Athletic Director to answer all their questions. The first step to starting a team is to talk to your Athletic Director. We have found that most schools are excited to offer horseback riding as either a club or a varsity sport, so talk to your Athletic Director to determine how riding can be integrated into your school's athletic program. We made a video to quickly answer all of your Athletic Director's questions. Check it out and then send it to them! Teams can be made up of any number of riders (even 1! ), and we do not need proof of school support. Click here for more info on teams. Unlike traditional horse shows, you don't need to own a horse (or have tack) to ride in ISHS. At our shows, you can either ride your own horse, or "lease" one from our host barn to ride in the show. The horses are fantastic-- about half of our riders compete on them! The judge doesn't care if you BYO-H or ride one of ours because judging is based on the rider-- not on the horse-- so every rider is competing on the same playing field. Click here for more information on leasing a horse. We have classes for all experience levels, and we welcome riders of all disciples to compete. 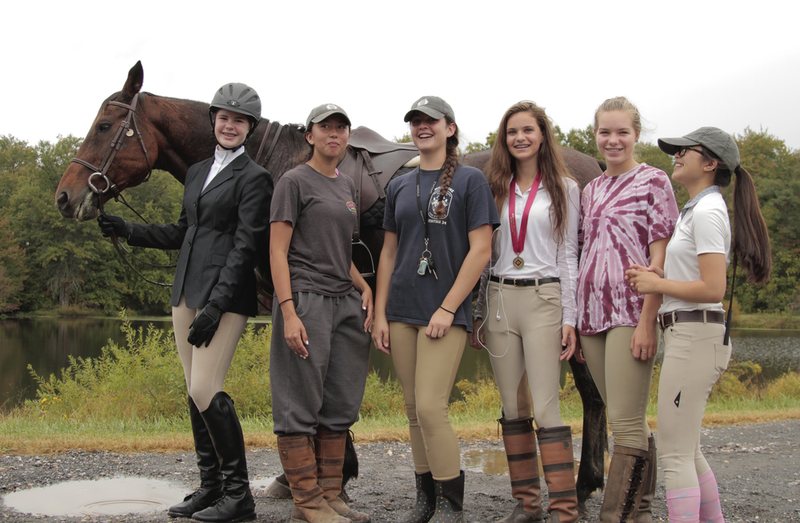 Our Varsity Advanced division is perfect for A Circuit competitors, and rookie riders love our JV Maiden Division. In that division, flat classes are walk/ trot and walk/ trot/ canter, and we let your instructor in the ring to help you over fences. Click here to see our Prize List and to watch sample over fences classes. Varsity Advanced is perfect for experienced equestrians. Click the pic to watch them hack. New to horse showing? Our Maiden Division is perfect for you! Click the pic to watch the video. Riding isn't a traditional school (or team) sport, but we make it possible for you to ride on a team and represent your school in the ring. Our shows are organized similarly to traditional Hunter shows, with a few adjustments to accommodate for teams. General info is below and click here to see more details. You need to have a coach on site a the shows, but your school doesn't necessarily need to provide one. Your coach just has to be a horse-knowing adult (parent, teacher, instructor...) who can help you during the show. We have ISHS coaches on site at every show, so if you/ your team needs a coach, just check the box on your entry form and we'll hook you up with one of ours. You must be taking riding lessons, but your school doesn't need to organize them. So as long as you're taking regular riding lessons, you're good to go. Click here for more info. Your school doesn't need any extra insurance. Our host barns have insurance, and your parent/ guardian signs a waiver. *This bullet point seems boring, but your Athletic Director's likely ask you about this. Throughout the year, we also keep track of both your individual points and your team's points. Then, at the end of each series, top riders are welcomed to our Invitational Show, and top teams are showered with Year End Awards. Registration is done show-by-show, and forms are due two weeks before each one. Click here for more info and to sign up. Click the pictures below to watch the videos. Click here to see more, and click here to see pictures from past shows.